These moments sometimes take us by surprise but they are always welcome and they always feel good. We recently had one of these moments. 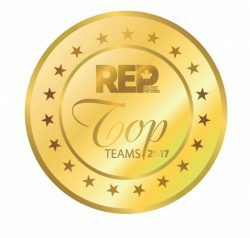 We found out that our team was recognized as one of the top teams in the Canadian Real Estate industry in the 2017 Real Estate Professional (REP) Top Teams report. In honour of this wonderful recognition, we want to share a bit of our history and journey with you. You’ll understand where we came from and why our efforts and dedications are being recognized nationally. After being in the business on their own for many years, Christine and Laurie’s individual success reached a point of critical mass. To maintain their recognized quality service, they were each looking for someone to work with, mostly to cover time off. In 2011, after Christine called Laurie, together they sipped the first of many shared cups of coffee. For two years, Christine and Laurie worked side-by-side, yet independently. This “double-espresso” ensured they could provide their clients with uninterrupted services 360+ days a year. Seeing the continued client satisfaction and the synergy they had while working side-by-side, Christine and Laurie decided to really join forces as full-partners. They became a “single-serve” operation known as Bussieres-Gagnier. In 2014, after doing a deal with Jeff, Christine saw how compatible his work ethics and values were with theirs. Christine and Laurie then shared many sips of coffee with Jeff while discussing further possible partnerships. In 2015, after many successful deals, a lot of happy clients and a whole bunch of empty cups of coffee, Bussieres-Gagnier-Miller, also known as BGM – Your Ottawa Team, was officially born. You could say that we carefully picked the top-quality coffee beans to make sure you got the best cup of coffee available. Although our flavours are individually distinct, you can rest assured knowing that no matter which bean you fall on, it will be one of quality. REP understands that in real estate, teams are built in order to maintain the great level of service that is sought out at an intensifying pace. In this business, reaching a point where starting a team is necessary is a fine accomplishment, but turning that team into an equally successful entity is even more impressive.